The value of EA might not be immediately obvious to a large part of your organization, sometimes not even your CIO. You need to be able to demonstrate its value – some even say that you should sell first and architect later. Your CIO usually cares about three things: saving money, increasing innovation levels and decreasing risk. EA can help him achieve all three, you just need to convince him of its value. Phase out obsolete applications and consolidate applications. It is possible to reduce costs by 15% by eliminating redundant applications without affecting quality and business value. This will not only save you license costs but also decrease costs for support and maintenance. Analyze your applications by Business Capability and User Groups. 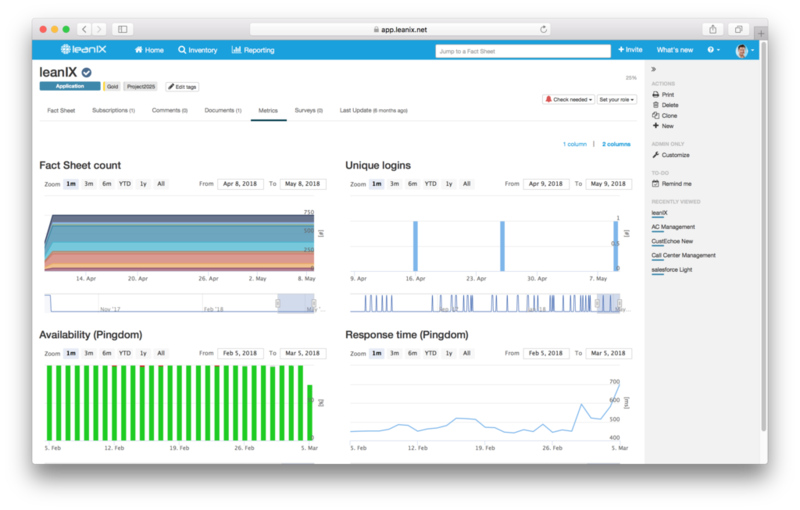 Use your Application Matrix with Business Capabilities and User Groups to look at your applications and configure it to view the functional fit. You will be able to identify support gaps and redundancies in your application landscape. It may make sense to agree on global standards across your locations and phase out non-standard applications. By rating the technical and functional fit of your applications you will be able to identify applications that are not up to the job and do not meet technical requirements. Focus on divesting those while also keeping an eye on their business criticality to make sure you do not switch off applications critical to the business without a successor in place. According to a case study by McKinsey, in an assessment of their application portfolio one retail bank was able to find more than 50 unused applications to decommission, 150 redundant applications to consolidate, 800 point-to-point interfaces to put on an integration platform and 400 applications to connect with a data integration platform. 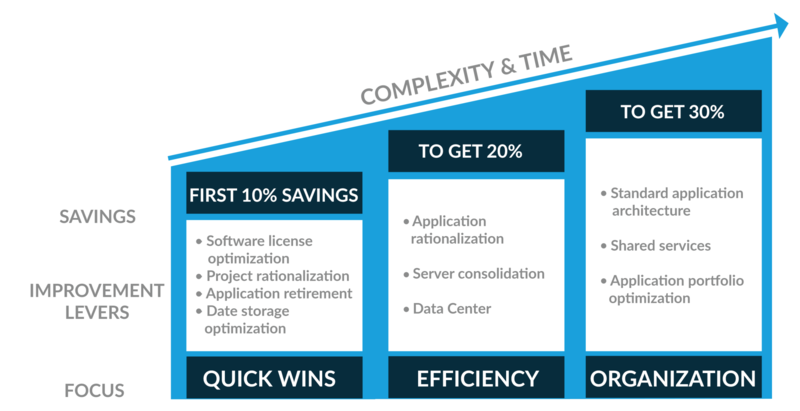 Application rationalization can be the basis for other cost savings activities, such as software license optimization, application retirement or server consolidation (see figure 2) with various levels of complexity and duration. Enterprise Architecture can provide important input on user groups and user numbers for IT use across the organization. Use your EA Inventory to analyze who your vendors are and how much you are spending with them and pass this information on to your procurement (see Figure 3). You will easily be able to identify opportunities where vendors can be consolidated or where procurement can negotiate better rates, as you can see how much you spend with them in total. Also, as Enterprise Architect, you are ideally positioned to be able to analyze the impact of any changes to the vendor landscape. Provide consolidation scenarios that address functionality issues from swapping IT components and reconcile any interdependencies. Work closely with your procurement department to ensure an effective vendor selection going forward and do not forget about the changes in support and training that come with a change in vendor and product. It is harder to put a figure on how much is saved by saving time otherwise spent on searching for IT-related information. But studies estimate that by using an EA tool a significant reduction is possible and even more time is saved on documentation and preparation of reports by using state-of-the art reports that are always up-to-date. Another benefit of having an EA tool in place is that everyone can be given access to relevant IT information, so time is saved distributing the information. Staff can also collaborate straight in the tool, directly in the relevant context. According to McKinsey, organizations can raise the productivity of workers by 20-25 % using social technologies.2 A searchable record of knowledge can reduce by as much as 35 % the time staff spend searching for information. You will be able to start projects faster because all the relevant information is already in place, which means significant savings in staff and consulting time and costs. Considering that a single IT consultant will cost a minimum of €20.000 per month, this adds up very quickly. And do not underestimate the benefits of documentation – losing knowledge can be costly business. Employees can leave your company taking their knowledge of systems with them. If you have no proper documentation, costs can quickly spiral out of control. €11 billion are estimated to be lost every year due to knowledge drain. A shocking example of how a runaway IT risk incident can have a catastrophic impact is what happened to the airline Comair, a subsidiary of Delta Air Lines. One busy December, Comair’s crew-scheduling system failed because it was only capable of handling a certain number of changes a month. The system abruptly stopped functioning, leaving nearly 200,000 passengers stranded throughout the US in the run-up to Christmas. Revenue losses as a direct result of this incident are estimated at about US$20 million. An up-to-date EA inventory gives you information on all your applications including the technologies they are based on. 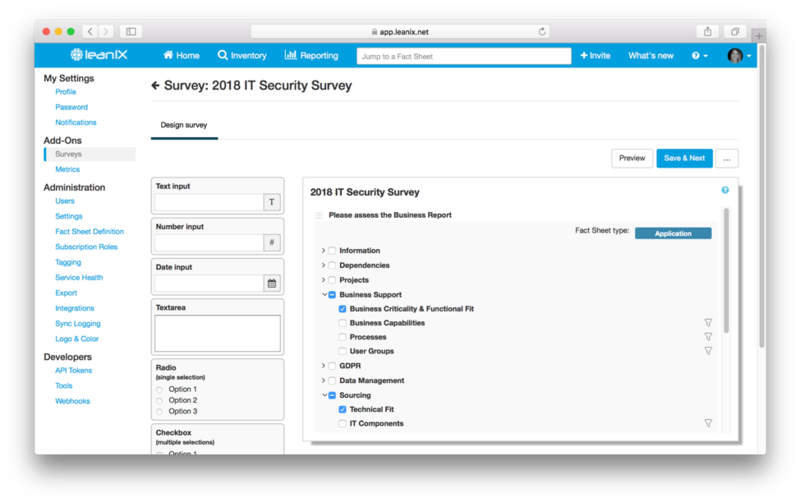 This helps you assess which applications might be at risk because underlying IT components are no longer supported and lets you keep track of your technology standards. Incidents that happen because of unsupported technology components on average will cost companies around €600.000. An EA solution offers the required support for determining the responsibilities and roles relevant to IT security. Clear responsibilities for Applications, Processes and IT Components can be set up and maintained. Quality mechanisms ensure that the data stays current and will be available in the right context in case of a security audit or incident. Your EA tool can also help you to classify the criticality of the data objects used by your company’s applications. With the help of EA, you can base your technology decisions on reliable, up-to-date facts. Most companies are much better at introducing new technologies than at retiring them. Even government agencies are not immune to this. US Government auditors blasted the Internal Revenue Service (IRS) in 2015 for missing deadlines to upgrade Windows XP PCs and data center servers running Windows Server 2003, both of which have been retired by Microsoft. Nine months after Windows XP fell off Microsoft's support list, the agency still could not account for 1,300 PCs, about 1% of its total, and so could not say whether they had been purged of the ancient OS. The IRS also had to pay Microsoft for post-retirement support contracts to be provided with critical security updates. Thanks to your EA Inventory it is easy to keep on top of IT components that are no longer supported and thus signify a risk. In LeanIX you can report on those applications that are at risk because the underlying IT components are out of their lifecycles. 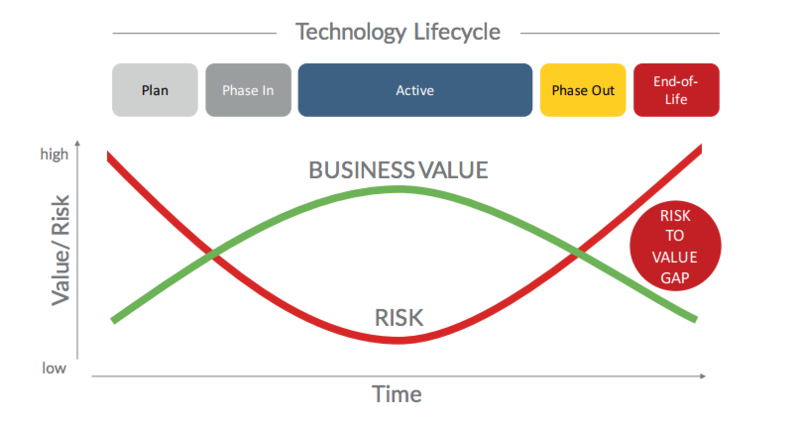 Figure 4: Business impact of technology obsolescence. Businesses need to comply with many regulations from HIPAA to PCI and FISMA. While compliance does cost money and in terms of technology requires an accurate view of applications and technology, the cost of non-compliance is usually higher. As a rule of thumb, experts say that the cost of non-compliance is 2.5 times higher than the cost of compliance. An up-to-date EA Inventory does not only provide you with reliable data that you can use to document your compliance with regulations. The LeanIX Survey Add-on can also help you to create ad-hoc or regular surveys for the appropriate staff to maintain accurate information about, for example, the use of sensitive data by applications. 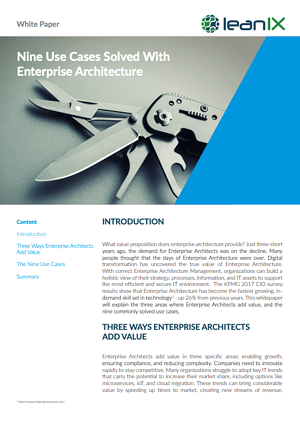 Enterprise Architecture can become a driver for innovation across the organization. Free up your mind for innovation: By simplifying efforts for documentation, governance and reporting the business can focus on driving change and making Cloud, Big Data and Digitization a success. Modern development methods like DevOps rely on access to information and reuse of services. You can lower the barriers to efficiency by simplifying efforts for documentation, governance and reporting, as you make all information relevant to your organization’s IT landscape available in your EA solution. Document automatically all new services, their lifecycles and interfaces in your IT inventory to achieve compliance with regulatory requirements. New employees also benefit as they have all the information about their IT environment necessary for their onboarding easily available. At online clothing retailer Zalando’s offices for example, developers work in over 100 small, autonomous teams in a microservices structure. But even independently working teams have to work towards a common goal and need access to information about their IT to be efficient. Zalando uses a team of Enterprise Architects to serve as a link between the various teams and programming languages. They are responsible for filling the gaps and enable the developers to have full responsibility for their software. Break down monolithic structures and engage your employees inside and outside of your IT organization to use the collaboration features of your EA tool. Develop a common language with all stakeholders to avoid misunderstandings and pick up speed. According to McKinsey, nearly 80 % of the senior executives surveyed in a study said that effective coordination across product, functional, and geographic lines was crucial for growth. Yet only 25 % of the respondents described their organizations as "effective" at sharing knowledge across boundaries.3 They also describe the case of an engineering company. An analysis of one of the company's high-performing groups showed that a small number of construction managers and engineers single-handedly accounted for 35 % of all the collaboration occurring within it. This kind of collaboration dramatically enhanced the group's ability to deliver expertise. Identifying and building connectivity between specialists in other groups helped the company to raise its revenue from $80 million to $275 million in a single year. Organizations comprise people, organizations, things, processes, goals, policies, rules, events, locations, and so on. For large organizations, it is impossible for people to retain and work with so many variables and bring about meaningful change unless information about them is documented through EA. By providing all relevant information in an accessible format in your EA inventory employees can access data about the enterprise and its technology landscape whenever the need arises. 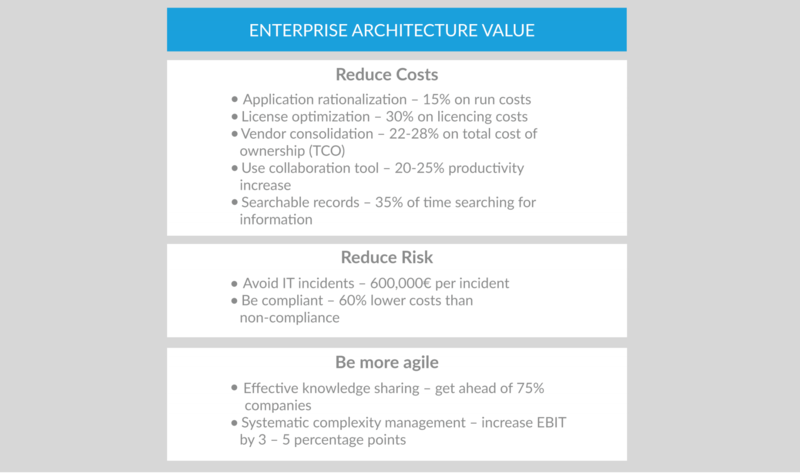 Enterprise Architecture can make an important contribution to decreasing the complexity within the enterprise and therefore allowing it to become more agile. Avoid spending too much time planning and modelling in too much detail. Sometimes Enterprise Architects are accused of living in an “Ivory Tower” and being completely removed from the realities of the real world and what is important to the business. Make sure your architecture is aligned to the realities of your organization’s IT, business and budget. Do not try to model everything and for every eventuality. You cannot anticipate all the disruptive events that will influence your business. Ten years ago, who would have predicted the invention of the iPad and the influence it has had on how we consume media and on corporate IT? By simplifying your EA models and focusing on your capabilities, you remain flexible enough to react to unexpected events and trends. When it comes to creating your EA inventory, you need to ask yourself, which problem you are going to solve and starting from there you can identify the data you will need to obtain and maintain. For example, if you want to identify which applications to invest in or divest according to their technical and functional suitability, you will need to collect information on the application and rate their technical and functional fit. Do not collect data without a good reason, as the more detail you have in your EA inventory, the harder it will be to assure its quality. There is always a trade-off: if you want a deep and detailed model you must compromise on how up-to-date your data is and how much effort you have to invest to maintain it. Think carefully about your use cases – which reports do you really need? Start with the one or two important use cases and collect the necessary information for them. This could be application rationalization; or you can always consider adding more use cases later on, as your EA practice becomes better established. When creating your Business Capability Maps, go for breadth rather than depth. An analysis of LeanIX workspaces shows that companies typically use 7-10 capabilities on the highest level, and 70% have only one or two levels of business capabilities. Following a lightweight approach has the clear advantage of reducing complexity and focusing on what is really needed. Neither getting too caught up in complex technical detail nor spending all your time on high level strategic models is useful. Focus on doing “just enough” EA “just in time” (Gartner)6 to achieve early results that are supported by the management. Do not try to make Enterprise Architecture be everything to everyone: focus on a small group of clear objectives, measure and track success. This will help you to really live EA! 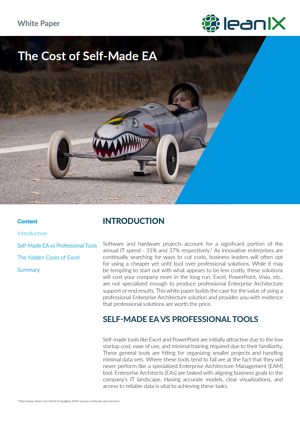 It definitely makes sense to introduce an EA tool early on – workarounds that are not purpose-built like Excel or Visio create more work in the long run, as they soon reach their limitations. Missing quality assurance mechanisms create problems over time and lead to significant expenditure for trouble shooting. Data capture and maintenance in spreadsheets is very error-prone as well as time consuming and needs a lot of resources. Distributed files across the organization make achieving a big picture of the interdependencies within the architecture impossible and lead to inconsistent and thus unreliable data sources. Find an EA tool that is easy to keep up-to-date, fosters communication and collaboration across the whole organization, makes it simple to share information and extract meaningful reports. Because of the distributed access, workflows will be optimized and stakeholders will be able to drive their own analyses. Your data quality will go up thanks to quality assurance mechanisms and will give your organization a much better basis for decision making. A month may not seem like such a long time but you can achieve a lot in 30 days. You want to focus on activities that deliver some early results to keep the enthusiasm by your management for your EA initiative going while also giving you a sound basis to build on. Concentrate on these five steps that will pave the way to an immediate clean-up of your portfolio information and thus to jump-start your EA! Collect your IT portfolio data. Having reliable information about your IT landscape is the basis for all your future activities. Inspect your existing data sources and formats and clean up their content. Remove any data that is outdated or irrelevant. Assign content owners and quality check your data with them. Once your data is refined, you can upload a sample to your EA inventory to test it. If it works out, you can complete the data migration. For LeanIX you have the option to migrate your data yourself using Excel spreadsheets based on a template, mass import using the REST API or to update the inventory manually. Leveraging data extraction features of existing tools can make it easier to create your inventory. Involve your content owners to improve your data quality and do not forget to test a sample. Once you have your basic inventory, it is easy to invite more users to get involved in maintaining the information. Assess your portfolio focusing primarily on business criticality, functional and technical fit. In LeanIX you can rate these categories from 1 to 4: Business criticality is thus rated from 1, which means that failures are undesirable but do not affect customers, to 4, which identifies a mission critical application: Breaks in service are intolerable and immediately significantly damaging. Availability is required at almost any price. This will already give you enough data for a first analysis of their relevancy to the business and hence which applications should be invested in and which should be divested. Invite everybody to keep track of planned measures in your EA solution and encourage debate about them using the collaboration features. Everybody is in the know all the time. The high-level assessment of business criticality, functional fit und technical fit you have implemented earlier gives you an invaluable communication instrument for the business and IT to spot improvement opportunities at a glance. If you added lifecycle information to your applications and technologies, you can easily produce roadmaps of what will happen in your IT landscape that are available to every user. When you have collected some key data, a lot of improvement ideas will jump out at you, for example rationalizing your applications, filling gaps in IT support or consolidating your application hosting. Assess all your ideas by their impact and ability to implement quickly. Focus only on the high impact/high feasibility projects for now. 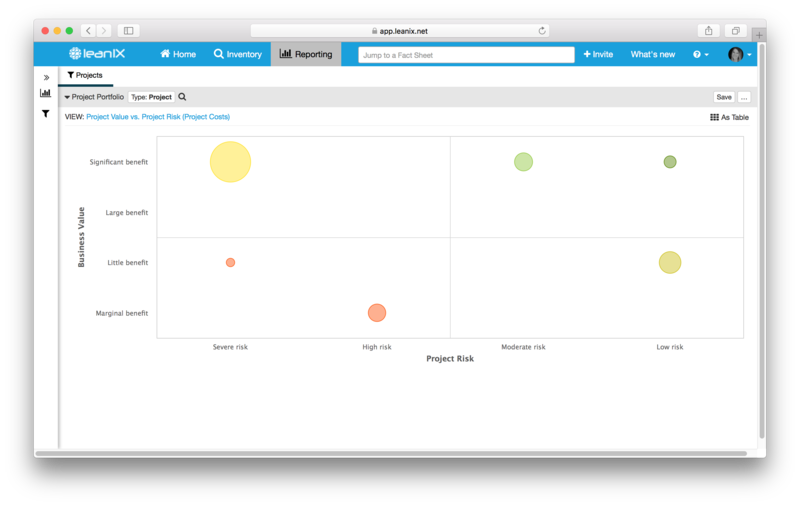 Define your first projects in your EA tool tracking value, risk, budgets and status. Projects should not last longer than three months. 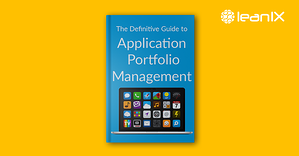 A good place to start is to identify and divest your redundant applications using the portfolio analysis described above. Others you will want to invest in, as they are critical to the success of the business. Once you have the information about your applications in your inventory, the next step is focusing on Business Capabilities and data. Business Capabilities encapsulate what a business is doing right now and what it needs to be doing to implement its strategy. Business Capabilities can help you to identify redundancies, spot risks and develop solutions, which is why it is crucial for you to develop your Business Capability Map. Start thinking about the major capabilities that your business needs to operate. On the first level should only be the critical ones, most companies have around 7-10 capabilities on the highest level. Once you have completed the first level, it can make sense to drill down one level. On the deeper level, all capabilities should completely describe their parent capability and be without overlap. About 70% of organizations have capability models that have only one or two levels. If in doubt, go for breadth rather than depth. When you have identified the major applications, the most urgent improvements and managed to get ahead of operational worries, it is time to look at data and how it drives your business. Focus on the key data objects that drive the business and the interfaces they use. Typically, you only need 10-20 data objects to get started. With such a basic set you can already answer questions about which applications have access to certain data and which do not; which information is classified and which can easily be moved into the cloud or who will be affected by an API change. Look at how the information flows across your application portfolio and whether there are any applications with an increased risk of failure due to their high number of interfaces. What happens further along the road depends on your use cases. Ask yourself what your questions are and what analyses you need to answer them. You can derive your necessary data from that. We recommend that you focus on one or two use cases at a time, implement them and then iterate again. Make sure you keep your users engaged, so they will maintain the data in your EA inventory. You could consider doing regular surveys to keep the data quality up or use a quality check mechanism that prompts application owners to check the correctness of the information at regular intervals. Focus on data that creates value and helps you with your use cases. Integrate automated data sources where it makes sense and make sure your EA repository becomes a trusted and reliable information source that is the basis for decisions. Have you thought about making key reports available on your intranet? Agile businesses rely on open access to information, make sure everyone who needs IT data can easily access it. Use your LeanIX iPhone app to demonstrate the value of having EA data always on hand, pull out your mobile at all times. 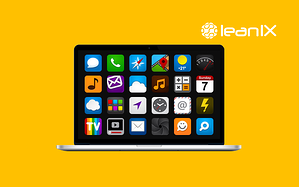 With the LeanIX iPhone app, all your EA data is always available. Use your data to help others understand complexity, business priorities and budgets. Do not limit involvement to the IT department. Engage the whole organization and keep the conversation going. Invite more people across departments to your EA platform to keep them informed. Technology decisions influence the whole company, so it is important to get people on board. Make sure everyone understands that digitization is not just an IT issue but will affect every aspect of the business. It is easy to slip into jargon when talking about EA. But while EA is not an easy concept to grasp, using vocabulary that people do not understand makes it even worse. Adjust your message to the target audience; for example speak of quicker times to market with the marketing department. Make sure to provide fast and real benefits to win allies. For example, assist the team that executes the acquisition of a new company by providing them with information about the future IT landscape. Do not get caught up in complex models that will not mean anything to anyone but you, but focus on tangible benefits. Initially it makes sense to focus on only a few areas and use cases. But over time you should tie EA into all of your company’s processes. Capture all responsibilities from the business and technical side and introduce policies that include providing all IT related information before a project is approved. Do not forget that establishing a successful EA program needs time and will go through stages. But once you have demonstrated first successes you will be able to use EA more actively rather than just reacting to requirements. Eventually your EA will be so well established that you can focus more on identifying opportunities and disruptions and thus drive business transformation and innovation. Your CIO wants to know what EA can do for him, sometimes he might not be clear on what value EA is providing. But you can demonstrate to him that transparency achieved through EA can answer some of his most pressing questions. What applications matter most to the business and how are they changing? EA can provide the answers to the questions relating to the organization’s application portfolio. From providing an analysis of the status quo that will allow decisions on what applications to invest in and which ones to divest based on reliable data to how well Business Capabilities are supported by technology. And you can play out different scenarios over time to make sure that your IT is aligned with business strategy. 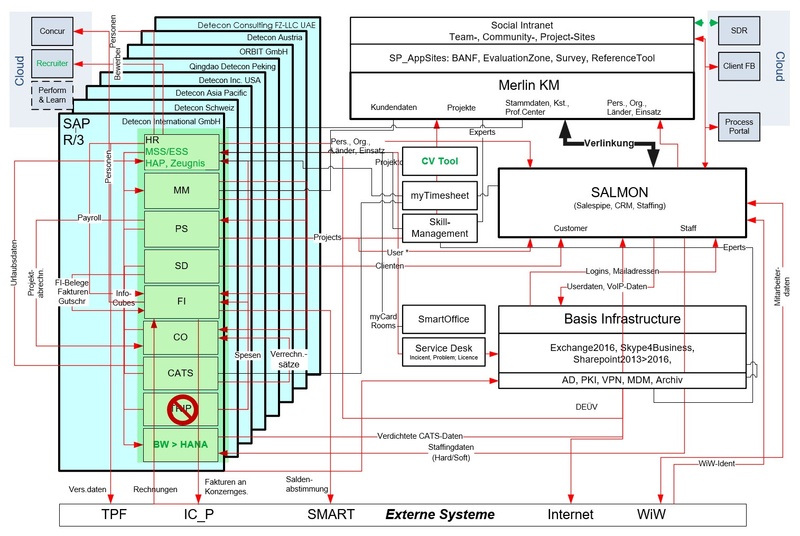 What are our critical technology dependencies and how can we optimize business data management? With EA your CIO can achieve a transparent overview of all dependencies between applications and which data is used where in the business. From knowing where each data object is used to uncovering possible data manipulation conflicts and possible points of failure due to a large number of interfaces. What are our technology risks? Your CIO wants to know about the risks in your organization’s IT landscape and how to keep safe. He needs to have transparency on important IT components and the potential risk they entail. From knowing which IT components are redundant and which applications are at risk because of that to how the application portfolio adheres to security standards. 4 Where’s our data and how is it used? Your CIO wants to know what data is used in the business and whether sensitive data is adequately protected. EA can provide him with the answers about the use of data objects and their business relevancy as well as ensure data consistency across the portfolio. From being able to provide information on which user group uses which data to which data supports which business capability: your EA tool can provide the answer. Who are our vendors and how are they managed? The CIO will always be interested who the organization’s vendors are and whether there is any potential to rationalize costs. From being able to tell who the providers are and how much is spent with each of them, to the potential impact on users if one is changed: manage all this information with the help of your EA tool. How much are we spending on IT? Your CIO wants to know what the IT budget is spent on to ensure that the investments are in line with strategic priorities. You can provide the answers from the cost of a single application to costs by business capability, user group, provider, project or IT component. Now that you have successfully installed an EA program in your organization, it is time to really reap the benefits. Combining EA methods with real-time data that was previously lost in silos offers great opportunities. Gartner says that “through 2017, 90 % of the information assets from big data analytics efforts will be siloed and unleverageable”. Vast amounts of data exist in companies; the challenge is to make it meaningful and actionable. Enterprise Architecture is ideally positioned for this job as it already facilitates communication between different stakeholders in technology and business. If you are going to integrate real-time data in your EA tool, you need to decide which data from which tools will provide additional value, for example login data from a mobile app, response time or availability. With the LeanIX Metrics Add-on, you can make use of several out-of-the-box integrations with applications that provide relevant data or connect your own data source using the open source SDK. Provide the answers to questions like: How does a new feature on the website catch on with visitors? Which areas of our software are prone to errors? Can the backend handle a user increase? How is the availability of an application? Is it meeting SLAs? Digital business models require almost real-time reactions to changes. The DevOps method was developed as close cooperation between development and operations was necessary due to requirements for solutions that need to be developed in a very short time and evolving in an iterative approach with frequent releases. Access to information by the team is vital, they need insights into availability and performance at all times. Many requirements derive from business analytics of user behavior. Thus business should be integrated into the DevOps team to be involved in real-time decision making to streamline processes. With LeanIX you have a platform that delivers the structure and up-to-date information that serves the needs of all three parties (see Figure 7). 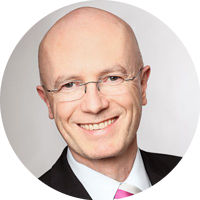 Michael Schomisch, Head of Corporate ICT at Detecon International and partner of LeanIX has started an experiment with the goal of structuring Detecon itself with an Enterprise Architecture approach in 25 days to ultimately making it more agile with the gained insights. And this, while getting GDPR-compliant on the side, which in itself is a complex challenge for most companies, even after the regulation has come into force in May 2018. The only difficult step was the self-commitment to start and keep up modeling for 25 days. Doing so provided amazing results. 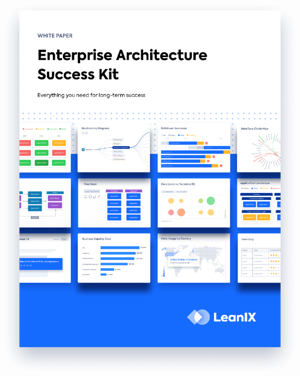 I invested 1-2 hours a day, this lead to regular new insights into our enterprise architecture and the modeling technique with LeanIX itself. After 25 days I got an overview of about 80% of the entire Detecon Architecture, more than enough to start sustainable discussions with our business and IT stakeholder in a completely new way. Being GDPR ready was the first challenge supported by LeanIX. The next big thing is transitioning to the S/HANA public cloud, which in my opinion would be impossible without EA. With LeanIX, we will be able to gain all the necessary insights to migrate." The first step on the way to implementing an Enterprise Architecture strategy is of course the filling of your “inventory". Michael Schomisch has started with the Detecon applications which is a good way to get an overview of the technological infrastructure and to get the ball rolling. In LeanIX Pathfinder, he created fact sheets for each application that list the lifecycle, dependencies, user groups, data objects, business capabilities and other information. This represents the basis for successful planning and should be populated with as much detail as possible. The more accurate the manually entered or - even smarter - imported data, the more conclusive the overviews, reports and ultimately the company-wide optimization potential will become later. If Enterprise Architects have fun with their tools, even weekends won't keep them from planning. On the fourth day, Michael Schomisch implemented the first business capabilities and experimented with hierarchy levels. In the next few days, the rest of the company's capabilities had to be imported, which corresponds to Detecon's Capability Based Planning procedure. The current business architecture, which is composed of existing business and IT structures, can now be modeled. Capabilities describe what a company does to achieve its business goals, while business processes answer the question of the how. Who says that IT specialists can only think abstractly? The comprehensive reporting in Pathfinder now already displays the inventory elements, such as IT components, providers or technical stacks in overviews and visualizes the risk of projects and the business value using the information initially imported. 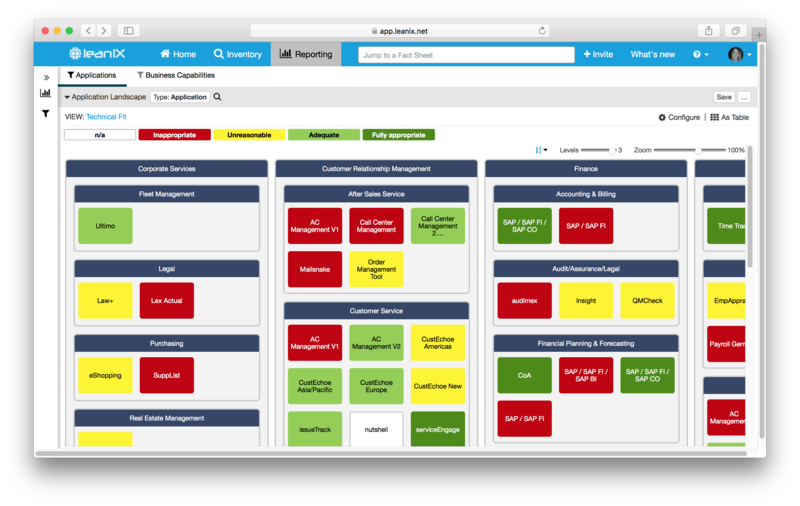 These and numerous other reports, including roadmaps, are ultimately the decisive aids that make successful Enterprise Architecture Management possible. In addition, they save the manual creation of such visualizations in order to bring departments and units in the company up to speed. The reports are also always up-to-date and show the current status of the components in the company. 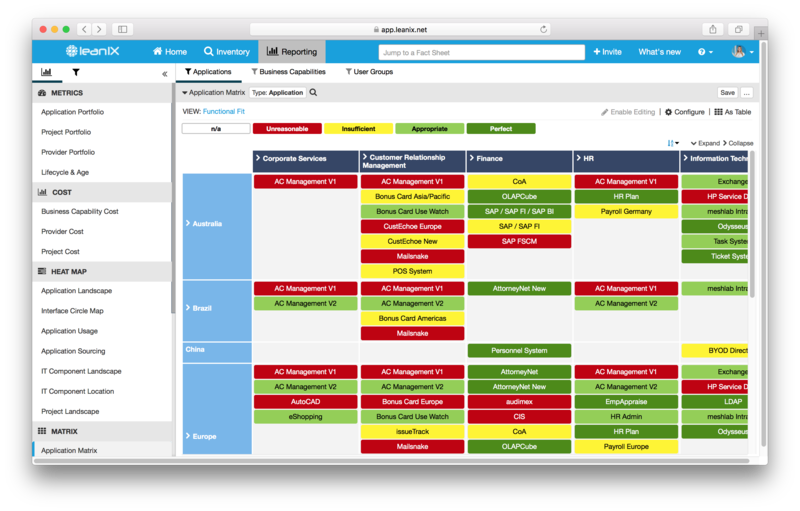 This real-time analysis is how every modern tool in a fast-moving business world should work. And what about the optimization mentioned above in terms of the GDPR? Since May 25th, 2018, the EU has stipulated that companies processing personal data must provide them to the authorities if requested. Including, what exact personal data is collected and processed at which points. 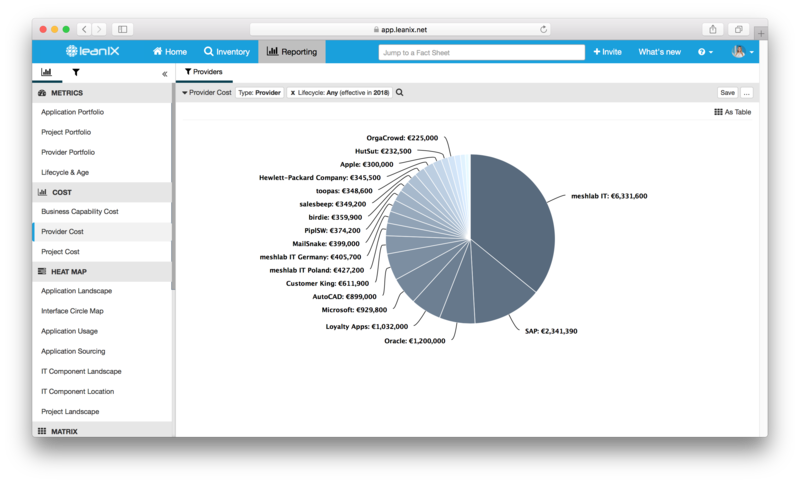 Here the reporting in Pathfinder can help as well by showing which applications, data objects, etc. use personal data and where this personal data is transferred to. Since the topic is still present and extensive in nature, we also recommend our free white paper "Mastering the GDPR with Enterprise Architecture" to prepare your company for the future with this aspect of personal data collection. Especially in regard to further business planning, GDPR compliance can be perfectly implemented into the Enterprise Architecture approach instead of collecting places personal data is used and maintaining it in static spreadsheets. 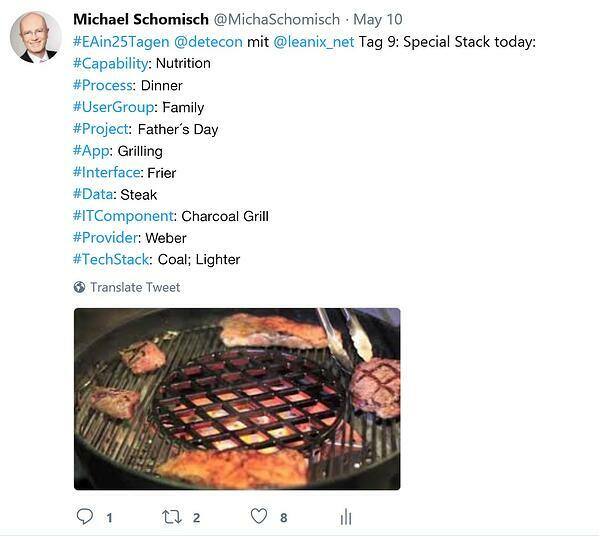 At the end of his 25 day long trip, Michael Schomisch ended up with the result below, which will also serve as a showcase and shows how simple and powerful Enterprise Architecture Management can be. Always remember; EA is a constantly changing structure that changes with organic growth and developments in the company. What do you think? 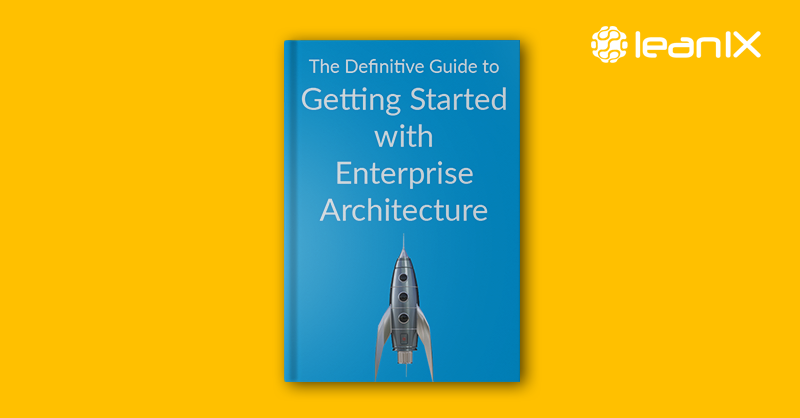 Are you ready to get started with Enterprise Architecture?